Earlier this month, I accompanied my wife on her work trip to Cambodia. Having never visited Southeast Asia (except two brief visits to Singapore), I was excited about traveling to a country known for being home to the world's largest existing Hindu structure. Upon my arrival in Siem Reap, once the seat of the Khmer Empire, the Hindu iconography in the Buddhist kingdom was striking. 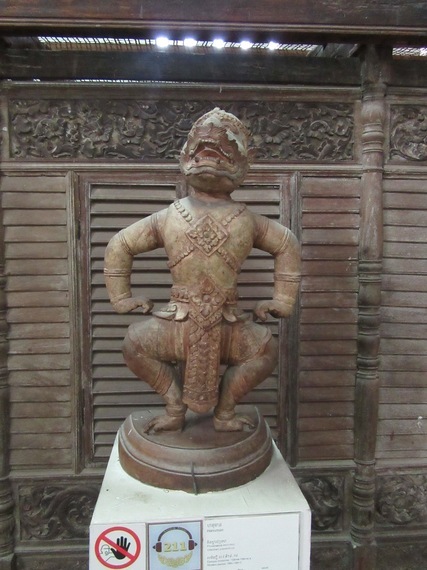 Khmer versions of Ganesha and Hanuman were present throughout the city, and both the Ramayana (known as the Reamker in Cambodia) and Mahabharata loomed large in popular imagery. In Angkor Wat, the 12th century Hindu temple structure that draws millions every year, Hindu deities loomed larger than life, including a statue of Vishnu at the entrance now worshipped as a Buddhist shrine. As we explored the Hindu temples (some of which had become Buddhist structures during the reign of Jayavarman VII in the latter 12th century CE), I was drawn to the level of devotion with which the structures were built and how they were inscribed. Additionally, as a Tamil, I was drawn to the similarities between the ancient Khmer script (which has roots in Southern India) and Tamil. 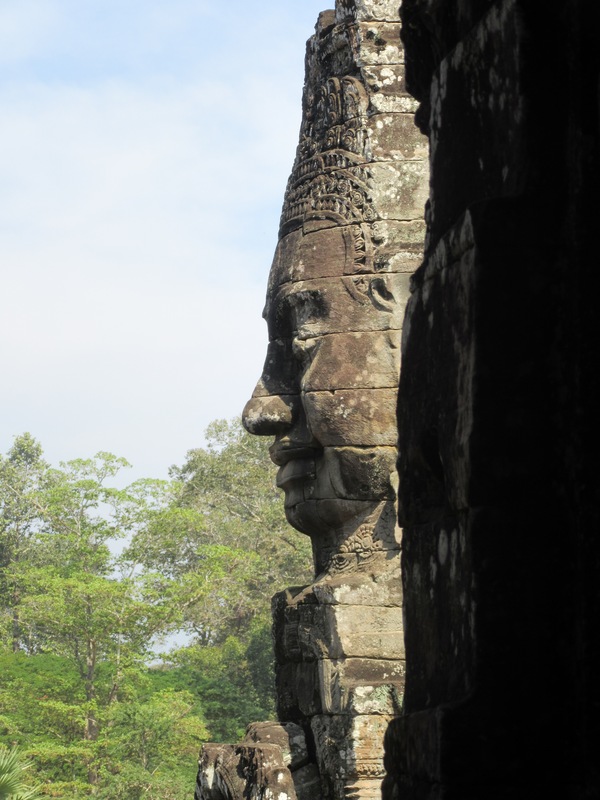 What makes Cambodia so interesting is that it is a country that has held strongly to its Buddhist identity for nearly 700 years, transitioning from Mahayana Buddhism to Theravada Buddhism following Jayavarman VII's reign. In fact, many of Cambodia's historical institutions mark "the beginning" of Khmer history with its development into a society that patronized Buddhism. Yet, so much of Cambodia's cultural heritage - and a lot of its tourism dollars - are devoted to an era in which Hinduism was either the dominant religious tradition, co-worshipped with Buddhism, or patronized by Khmer rulers. Even at the Royal Palace in Phnom Penh, much is made about a sword believed to have been given to the ancestors of the royal family by the Hindu deity Indra. At the national museum, the various forms of Hindu divinity dominate exhibit galleries, while visitors are unable to tell between the multi-armed form of Buddha (Lokeshvara) and Vishnu. The reason? 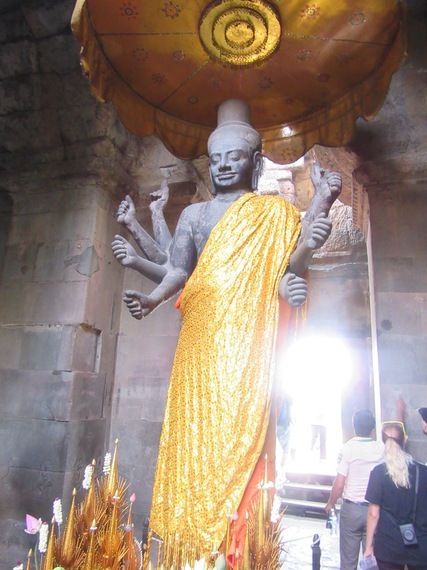 The statues were likely worshipped as both at different periods of Khmer history. Additionally, Cambodia has celebrated the return of figures from the Ramayana that were looted from the country in the years during and after French colonization. Today, one of the challenges Cambodia faces is maintaining that rich history amidst pressure to modernize (and cater to a growing number of expatriate visitors) and investment from countries such as China, which has invested millions into highlight Cambodia's Chinese Buddhist history. As such, Cambodia's continued willingness to preserve its Hindu heritage will depend largely upon support from the global Hindu community, which might not be aware of the extent to which Hinduism influenced Southeast Asia. Even today, names such as Devi, Vidya, Rama, and Krishna are popular among Cambodians, reflecting an interesting absorption of Hinduism into Buddhist culture. As I left Phnom Penh, I appreciated Hinduism's global expanse more than ever. Even if Hinduism no longer exists as Cambodia's dominant religion, its impact on the culture - and lasting physical legacy - cannot be understated.